Poland, the first Constitution in Europe. 220 years later. The Polish Constitution of May 3, 1791, was the first Fundamental Law adopted in Europe and the second world’s Constitution after that of the United States in 1787. The document was a secret project and its final version was drafted among others by the politician and thinker Hugo Kołłątaj. The Sejm session which led to the adoption of the Constitution was held in an atmosphere of a coup d’état. 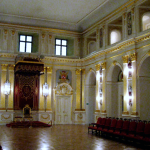 Many deputies came to the Royal Castle in Warsaw, where the session was taking place, in secrecy and the castle was guarded by numerous troops. After a heated, but short debate, the Fundamental Law was adopted with a majority of votes. The Constitution of 1791 comprised 11 articles. It introduced the principle of independence for the nobility and townspeople and the separation of powers between the Legislature (a bicameral Sejm), the Executive and the Judiciary branches. Peasants came under the protection of the law and government. This was the first step toward the ending of serfdom. The Constitution provided for “ordinary” meetings of the Sejm once in two years and special sessions when required by national emergency. The Lower Chamber, called the Chamber of Deputies, was made up of 204 deputies and plenipotentiaries of 24 royal cities. The Upper Chamber of Senators comprised 132 senators, including province governors, castellans, government ministers and bishops. The Constitution abolished the liberum veto. The Executive power was in the hands of a royal Council, known as the Guardians of the Laws. This Council was presided over by the King and included five ministers appointed by him: the minister of police, the minister of the seal (internal affairs), the minister of the seal of foreign affairs, the minister of war, and the minister of the Treasury. The decrees issued by the King required countersignature by a minister. To enhance the unity and security of the Commonwealth, the Fundamental Law abolished the Union of Poland and Lithuania in favour of a unitary State. This decision was the end of the Union of the Crown of Poland and the Grand Duchy of Lithuania, which had been established in 1569. The Constitution changed the free royal election system to a dynastic elected monarchy, which was meant to reduce the influence of foreign powers in royal elections. The Constitution acknowledged the Roman Catholic faith as the dominant religion, but at the same time it guaranteed freedom to all religions. The Constitution of May 3rd remained an unfinished work. It was in effect for only one year before Poland lost its independency. The last attempt at preserving the its legacy was the insurrection led by Tadeusz Kościuszko. In 1794, in Cracow, he issued the unprecedented “Proclamation of Połaniec,” granting freedom and ownership of land to peasants who fought in the insurrection. The insurgents had some initial victories, but then the armies of Russia, Austria and Prussia launched a military crackdown. The defeat of Kościuszko’s forces led in 1795 to the third and final partition of Poland.